If you are into juicing leafy vegetables, a masticating juicer is what you need. But the question is, which one among the many brands out there? One masticating juicer highly rated by consumers is the Omega J8006. It is an improved version of the Omega J8005. The whole juicer is black and chrome in color. The black color was used to keep it free from stains. 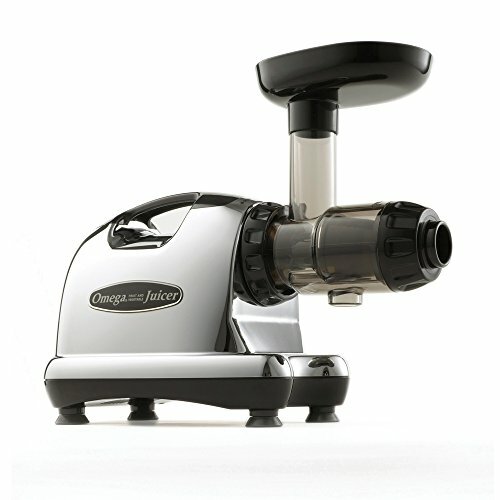 The Omega J8006 is a masticating juicer, also referred to as a slow speed juicer. Spinning at only 80 rpm, there is no way it can get in a marathon race with the speedy centrifugal juicers that can reach speeds of 14000 rpm. But a slow speed is not bad, it has its own advantages. Juice produced from the J8006 has less form when compared with that from a centrifugal juicer. Additionally, the juice can be stored for up to three days without going bad. This is because the slow speed does not oxidize it in as much as centrifugal juicers do. A common problem among centrifugal juicers is that they generate a lot of heat during operation. This can potentially damage the vitamins in the juice. But with the Omega J8006, there is no heat build up in the machine. This is also important for the motor as too much heat could shorten its lifespan. As if that is not enough, the slow speed ensures low noise levels (no one will think aliens are landing nearby, which is the case with most centrifugal juicers). Omega claims the slow speed also helps extract more vitamins and enzymes. The dual-stage juice processing system is again a blessing. It is not difficult to see that the pulp coming out is very dry. This is results in a high yield. As said earlier, masticating juicers are especially good with greens. And this juice unsurprisingly excels at that. But it can also handle soft fruits with ease. You will find that when juicing soft fruits, it can clog. If this happens, pressing the reverse button 2 or 3 times does the trick. Additionally, there is a plunger you can use to push food down the chute if it gets stuck. And talking about the chute, perhaps that is the one thing you might not like about the J8006. It measures only 1/1/2 inches. This so small and you might need to spend some time cutting your food into smaller pieces. Some suggest the small chute is meant to avoid overfeeding the juicer which could stress it. Others say it is to allow the juicer more time to work on the food than if it comes in large quantities. When getting a juicer, one think to keep in mind is the easiness of cleaning. A juicer too hard to clean will likely put you off when you just want a single glass. Fortunately, the J8006 is so easy to clean. The parts that require cleaning are not many. To make it even easier, the machine is so easy to assemble and disassemble. When you are done juicing, you can simply put the parts in your sink and it should not take more than 2 minutes to finish the whole cleaning process. Actually, there is not much to complain about this. If you are in the market looking for a juicer, do not forget to check this offering from Omega. Built solidly like a rock, the high yield and more positives going for it, you will surely not regret spending your money on the J8006.